Liviu Bird previews the star-studded first-round MLS playoff matchup between the Seattle Sounders and LA Galaxy. The Seattle Sounders and LA Galaxy comprised part of the Western Conference logjam of three teams tied on 51 points. Seattle only hosts their playoff game on Wednesday (10 p.m. ET; UniMás, TSN2, MLS Live, RDS2) by virtue of having one more regular-season win, though LA’s goal difference is two goals better. In other words, this is about as close as a playoff game can get, especially considering the teams’ similarities in playing style, coaching philosophy, roster budgets and championship expectations. Sigi Schmid and Bruce Arena, the two winningest coaches in Major League Soccer, allow the individuals at their disposal to show their creativity, which can result in quite a show with the personnel available to them. However, the Galaxy have a definite historical edge in playoff matchups. Arena’s team defeated the Sounders in 2010, 2012 and 2014, the latter two meetings coming in the Western Conference final. 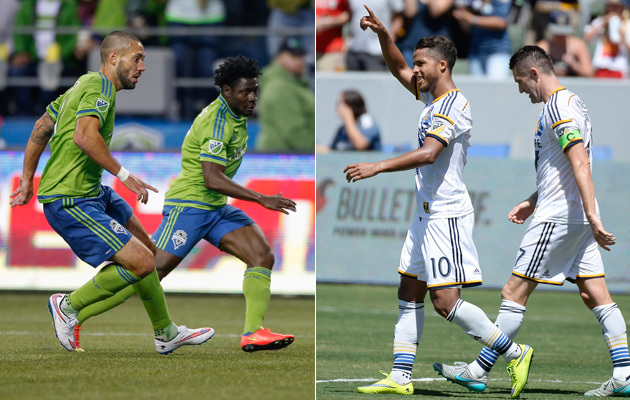 MLS Playoff Power Rankings: Who is most likely to win 2015 MLS Cup? Before the 2015 season, these teams seemed destined to meet there again, but midseason blips from both derailed that possibility. This will be the second time they’ve met before the league semifinal, though their 2010 series came as LA won the Supporters’ Shield in Seattle’s second year. This will be a one-off, knockout-round match between two teams who expected more of themselves during the regular season. One season has to end, meaning two explosive attacks will be trying to win over 90 minutes rather than 180. Seattle seems to have one midseason streak every year that causes concern, but this year’s blip was a bit bigger than most. Clint Dempsey suspension for his Open Cup outburst that included him tearing up a referee’s notebook coupled with Obafemi Martins’ groin injury at the same time, resulted in the Sounders rattling off nine losses in 11 games, dropping from first in the West to sixth. Without their Designated Players in attack, the Sounders’ vulnerability on the back line and inconsistency among their other attackers seemed far more serious than ever before. They shored up those concerns in the summer window by bringing in Panamanian central defender Román Torres and Paraguayan forward Nelson Valdez, who scored on his debut. That couldn’t alleviate Seattle’s poor injury luck, though. Dempsey has been limited until recently by a hamstring problem and fatigue from being with the national team, while Torres tore his ACL and Valdez has played just 413 minutes since mid-August after picking up a couple knocks. The newest injury concern for Seattle on Wednesday is Osvaldo Alonso, who asked to be taken off in the 73rd minute of Sunday’s 3-1 win over Real Salt Lake. His absence from the first game of the Sounders’ series against LA last year and limited minutes in the second, dictated by a bum hamstring, gave the Galaxy an edge in midfield on the way to a victory on away goals. As soon as the playoffs roll around, injury updates become even more obscure than usual, with coaches trying to maintain every advantage possible until they hand in the team sheet an hour before kickoff. As such, it’s not too surprising to see Schmid keep a tight grip on Alonso’s status this week in training. However, he said after Sunday’s game that the substitution was precautionary and that Alonso should be fine by midweek. Especially given what happened last year, the Cuban midfield destroyer will likely be on the field as long as he won't be a liability. The Galaxy bookended a midseason surge with two difficult spells on either end, finishing the year on a 1-4-2 run after beginning 3-4-5. The team’s fortunes turned briefly as Steven Gerrard and Giovani dos Santos joined in August. Regardless of how LA played ahead of the playoffs, Arena’s team has shown that as long as it makes the postseason, it will be a dangerous side. That should be no different this year, especially with the pedigree it has in attack. On the opposite end of the field, it’s a bit of a different story. Not unlike Seattle and others who spent big money on attacking Designated Players, the resulting lack of balance means LA remains defensively vulnerable. Neither Juninho nor Gerrard in midfield like to defend, and Leonardo and Omar Gonzalez have shown a propensity to step up to cover the resulting gap, which only opens more spaces in the back line. LA doesn’t seem to mind conceding goals, as its 46 is second-worst among MLS playoff teams, because its talent on the other end made up for it to the tune of a West-leading 56 goals in the regular season. This Galaxy team might even be more dangerous than what it was in the era of Keane, David Beckham and Landon Donovan. Particularly once Gerrard and dos Santos have a full MLS preseason next year, LA could end up ravaging the league again. Not to say the Galaxy, which took the 2015 season series against Seattle 2-0-1, couldn’t win this year. As it showed in winning MLS Cup as a No. 4 seed in 2012, anything is possible once the postseason starts. Brad Evans has been a makeshift center back for much of the Sounders season, and though he’s recently avoided the goal-inducing mistakes of the early season, it’s still far from an ideal situation. Seattle looked set when Torres joined the team to accompany three-time MLS Defender of the Year Chad Marshall, but his knee injury leaves the team right back where it was at the start of the year. Against a dynamic Galaxy attack that includes Keane and dos Santos, as well as Gerrard and Juninho making late runs when Keane pulls wide, Evans and Marshall will have to be sharp all game. Seattle’s hopes hinge on them winning this battle and forcing LA to be similarly perfect in defense, which the Galaxy have been only eight times in 2015. A similar argument could be made on the other end of the field, where Leonardo and Gonzalez will have to shut down Dempsey and Martins. The LA pair’s decision-making has been suspect all season, which means the Sounders attackers should be able to pick them apart with some calculated play.